Check your emails if you're subscribed to the McCain mailing list! They sent out a coupon for a $1 off Deep N Delicious Cakes! The email was titled "Some sweet savings and Happy Holidays from McCain". Offer valid from December 20, 2016 at 10:00AM EST to December 24, 2016 at 11:00 AM EST. 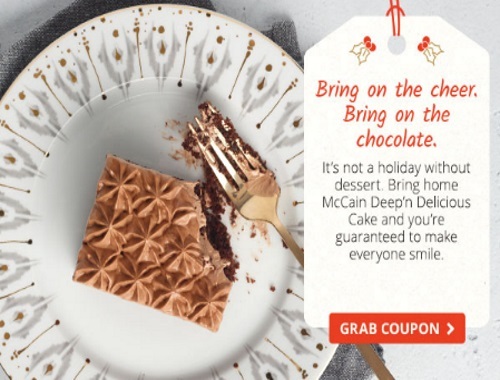 Only McCain Canada email subscribers as of December 20, 2016 at 9:00AM EST are eligible for a coupon. Only one coupon per household. Click here to join the Mccain mailing list.